Severe aching and fatigue of muscles. Restlessness and uneasiness cause you to move around. 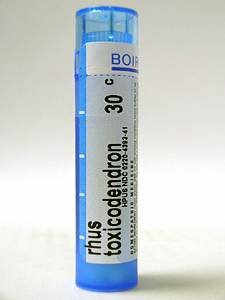 For wisting pains also like with Ruta Graveolens. Stiff, lame and bruised feeling. Knee injury and pain from overuse and inflammation. Plantar fasciitis or bone spurs or heel pain. Worse on first motion, then better with continued motion. Worse from cold damp weather, especially when perspiring. Worse from evening until mid-night and from uncovering body. Better warmth, gentle motion, massage. 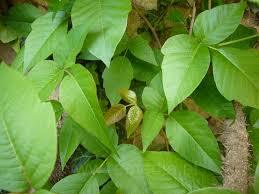 Rhus tox is a plant remedy made from the plant commonly known as poison ivy which grows as a shrub or a woody vine. Found commonly in the Eastern USA and Canada. #2 sports remedy after Arnica and one of the most popular remedies used in homeopathy. 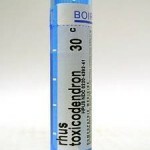 Rhus tox is at number 11 out of nearly 4,000 remedies when listed are listed by number of symptoms described. 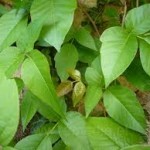 It has 11,400+ symptoms associated with it, that it can cure in the body!